Although he couldn’t make it to our Google Hangout, Jason Heppler was kind enough to respond by email to some questions that I sent him. Feel free to chime in with further questions or comments! 1. Introduce yourself and tell us a little bit about your individual research interests. I am a historian of the twentieth century American West and digital history. My Master’s thesis and accompanying digital history project studied how mass media covered the Trail of Broken Treaties in 1972, a Native American protest that included marching on Washington D.C. and occupying the Bureau of Indian Affairs for seven days. Early in my Ph.D. program, I was hired to serve as the project manager on the William F. Cody Archive at the Center for Digital Research in the Humanities. I’m currently working on a born-digital scholarly article about Cody and Native Americans hired to perform in Buffalo Bill’s Wild West. My primary research now is my dissertation. My project is about technology and urban change in California and Utah. These two locations underwent the move into the knowledge economy between 1950 and 1970, most prominently by serving as two of the original four nodes part of ARPANET. In particular, my project traces the spatial politics of social and cultural change in the second half of the twentieth century and how the burgeoning digital economy played a role in the process. Activists, politicians, business owners, and residents shaped the political and economic structure of changing metropolises, which highlights contests over space at a moment in time when the information sector was exerting enormous change upon regions. 2. You now have a job that some would classify as “alt-ac,” a job that explicitly engages with digital humanities or digital history as a field. Can you talk a little bit about how you ended up in this position? I was fortunate enough to be at a graduate school that takes digital history seriously, and had the opportunity to work with big names in the field. My decision to attend UNL for graduate school was, in part, driven by my desire to engage with digital history. While at UNL, I had many opportunities to learn skills and participate in the planning, implementation, and management of digital projects – starting with my own research projects, then helping with research on larger research initiatives, and finally becoming project manager for the Cody Archive. As I mention below, I self-taught myself a lot of technical skills but also took all the courses that UNL offered in digital humanities that helped me understand the history of DH, what DH was trying to do, and the big theoretical and practical issues DH faces. My experience gained in graduate school helped put me in a position where I was a competitive candidate for my current job. In January 2013, I joined Stanford University as an Academic Technology Specialist. My position is housed within Stanford University Libraries but I am embedded in the Department of History, where I work with faculty and graduate students on integrating technology into their research and teaching and also serve as an advocate/evangelist for digital humanities. I have a unique mix of tasks that I pursue, from developing and designing digital projects to planning and running workshops. I also have opportunities for classroom teaching. I’m still new to the position, but I’m already starting to have projects coalesce into something. I serve as a strategic ally in fostering the vision of projects. For those looking into jobs in digital humanities, there are a lot of opportunities to see the kind of work that’s out there and the sort of skills employers expect from potential candidates. Sites like Digital Humanities Now, HASTAC, and code4lib frequently post job listings (I found my ATS job through DH Now, for example). Job postings frequently pop up on Twitter as well. Graduate school doesn’t necessarily prepare you for these kind of jobs in the way it’s structured – the assumption is most graduate students will go on to professorial jobs, so programs are designed around teaching and research. Paying attention to job listings will give you a sense of what’s going on in digital humanities and the kinds of skills are needed to do this work. And if you’re finding you’d like to work in DH, try and find an ally in your department that supports your ideas and vision for your career. 3. How much familiarity with digital tools and/or coding did you have before starting graduate school? How did you acquire the technical computing skills you now have? I’ve always wondered if I’m something of an edge case in digital humanities. I have a long history with technology and, all through high school, thought I would be studying computer science in college. But I was always interested in history as well, and it won when it came to deciding what I wanted to do in college. I liked the idea of teaching and research, deciding at the time that being a professor was something I wanted to do with my career. Not once in college did I really do much with computers, aside from some work as a freelance web designer (and being a fervent listener of Leo Laporte’s netcasts). Part of my acquisition of tech skills was intentional and stems from high school: I built computers, I took computer classes, I played with the BASIC and Visual Basic computer languages, I taught myself HTML. But coming into graduate school, I wasn’t up to speed on modern languages or web development – I had never used CSS before graduate school, never wrote a line of code in Python or PHP, and had no idea what vim was. My mentor at my undergraduate institution talked to me one day about this emerging method of digital history, and I was intensely interested in this marriage between the two things I was passionate about. The University of Nebraska-Lincoln was my first choice in schools, not only because of their excellent reputation in the history of the American West, but also because they had an established presence in digital humanities. At UNL is where I picked up most of my skills: I was thrown into the briar patch of PHP, had a crash course in MySQL, took Stephen Ramsay’s course on Ruby programming, was tasked with building an iOS app in thirty days (with no prior Objective-C knowledge) for DH seminar, and enrolled in every available course in digital humanities. Most technical skills were self-taught, others were formal instruction. The web is a wonderful resource when it comes to learning technical skills, and DHers frequently share tutorials and ideas with one another through blogs. 4. Talk a little bit about the place of digital humanities in the broader department or University you are in. What kinds of institutional support does the digital humanities have there, and what are the primary challenges (from an administrative or resource point of view) that you face? I don’t know that I can speak to challenges quite yet since I’m still wrapping my head around things here at Stanford, but the support for digital humanities is fairly extensive. The Spatial History Project emerged originally from the History Department to support Richard White’s research for his new book. The department maintains that close relationship with what is now called the Center for Spatial and Textual Analysis (CESTA), which houses the Spatial History Project, the LitLab, and Humanities + Design. Stanford University Libraries also supports Digital Humanities Specialists that work on various faculty-led projects like the recently-released City Nature. There is a lot of interest in my department about digital history, so I’m in a great position where I can help foster collaboration and ideas. In other words, there is a lot of support – institutional and otherwise – for digital humanities at Stanford. 5. Collaboration and “open access” seem to be “things digital humanists like” (to paraphrase Tom Scheinfeldt). Do you agree? Are these values specific to digital humanities or are do you think they should have a broader reach? These are definitely things I like. Collaboration gets a lot of love in digital humanities, and rightly so – but it’s useful to bear in mind that collaboration has always been central to our work as scholars. Nothing we do happens in isolation – we work with colleagues, librarians, archivists, and so on. What digital humanities does, I think, is makes these collaborations more visible while also expanding the sorts of collaboration we do. Not only is collaboration intellectual and methodological, but DH adds the dimension of technological collaborative work as well. I think about open access a lot, which stems in part from a desire to have our work be public-facing. I believe that anyone seeking information and knowledge should have the potential to access that material. Furthermore, if a scholar has received public funding, I believe there’s an obligation to release the work as open access – to give back as a public good. Furthermore, if historians care about the quality of historical content on the web – where research often begins, not only among our students but among ourselves as well – then we need to contribute to the creation of scholarly work that’s accessible in that medium. “If historians believe that what is available free on the Web is low quality,” Roy Rosenzweig has noted, “then we have a responsibility to make better information sources available online.” Let’s do the work to get good content out there. 6. One of the topics that came up frequently in our Google Hangout was the future of digital publishing and peer review. From your vantage point, where do you think academic publishing is headed, and what seem like the most promising ways forward? I have a longer blog post I’m working on to discuss this question and trace the evolution of digital history publishing, but I spend a lot of time thinking about this issue. The short version: digital publishing is stagnant among traditional publishers, both in terms of born-digital publishing and in the evaluation and promotion based on digital work. To that end, Doug Seefeldt, Alex Galarza, and I are trying to get the American Historical Association to address digital publishing and peer review. In response to an open letter we sent to the AHA, they’ve set up a Task Force to look into the matter. I have also been part of UNL’s NEH-SUG that has brought editors together to discuss the challenges of digital publishing and peer review. As I mentioned on the Gradhacker #alt-ac podcast: get online. I meant it there in the context of #altac, but it applies to digital humanities as well. The community surrounding digital humanities on Twitter is an amazing group of people who are more than willing to offer ideas and suggestions. Check out the #digitalhumanities tag on Twitter as well to find people. Follow them on Twitter, follow their blogs, see the sorts of projects they’re working on. If you’re looking for things to read, check out Digital Humanities Now and look over some syllabi for books and articles. And there are many amazing digital history blogs out there to follow that will introduce you to all sorts of exciting projects and ideas. Although not necessarily specific to DH, but a general word of advice: go buy a domain of your own. Don’t leave your online identity to your department webpage or Facebook or Google. Own your identity, start blogging, start sharing ideas, learn how to set up things on a server securely. Having a server of your own also means you have the flexibility to install things like databases to learn about WordPress or Omeka. This entry was posted in Career, Grad Students, Interviews. Bookmark the permalink. 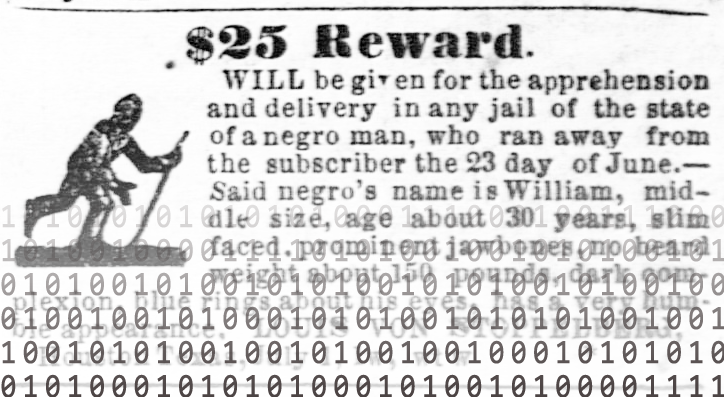 This website is currently the home for HIST 318, an undergraduate course that will be using digital tools to locate, analyze, and visualize a collection of runaway slave advertisements from a Texas newspaper.